In the project space Metaphor is pleased to present The Reflective Veil, work by Patricia Miranda and Tricia Wright, two artists who explore the psychological implications revealed in a mirrored surface. The reflective surface in both artists' work necessarily includes the viewer in the experience... literally implicating them in the process of the work's agenda. While the isolation of specific body parts, for Wright the eyes, for Miranda the hands, further accentuates the mysterious power of gesture and gaze as a communicative force. Both artists tease our subconscious awake by revealing their subjects obliquely. Emerging from darkness in polished graphite, hidden in the masked mirrored glass, these images of hands and eyes transform into reflections of memory, fear and desire. 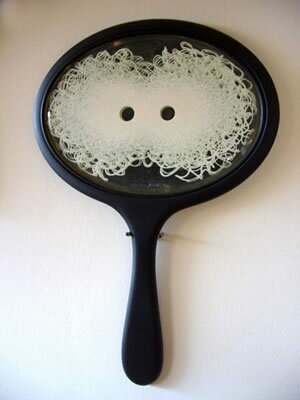 Using her trademark filigree lace-like drawing, Tricia Wright creates a veil or mask in ink and acrylic on found vintage mirrors in her surrealist sculptural series Hand Mirrors. They are presented wall-mounted and laid flat, (both face up and face down), and are meant to be handled. The painted peep holes are sized and positioned so that when each mirror is held up to the face the eyes are completely isolated and the sensation is startling and powerful. 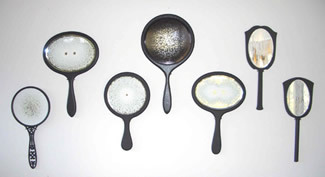 Tricia Wright has written about her Hand Mirrors project: "These pieces are about perception and the distance between private experience and how we are perceived by others. They explore the love/hate relationship that women and especially girls have to mirrors, and the double-edged sword of external appearance. In the crackled mirrors I was thinking about a fairy tale that I remembered from my childhood, a cautionary tale about distorted reality." Drawing, etching and inscribing directly into black graphite, then sanding and burnishing the surface with an agate stone, Patricia Miranda creates a reflective plane akin to polished ebony or a black mirror. 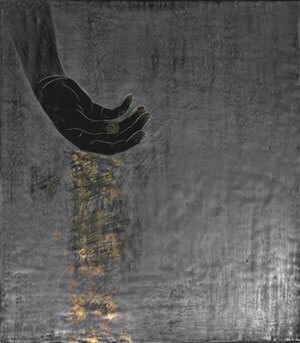 Her images of hands emerge slowly from the metallic surface. The use of 13k white and 22k yellow gold leaf, rubbed back to a subtle light emerging from the dark, makes the image seem to materialize from behind, as though rising from dark water. Patricia Miranda has written about her imagery: "Hands, to me, are extremely private parts of the human body, yet at the same time our most public. They embody our innermost personality and yet are the first extension into the world, like branches of us reaching out. With our hands we do the most intimate things- both creative and destructive. We make love, we caress, hold, shape, reach, carry, build, and we also slap, hit, push, punch, destroy. 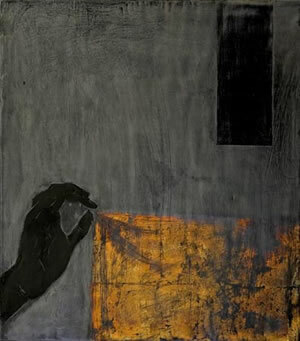 Somehow, in the depiction of hands, from hands inspired by medieval paintings to the expressive hands of those I love, I get close to the ephemeral spirit of a person, the almost thereness of them. The use of dark graphite and glass pushes the sense of the fleeting nature of things, how fragile and yet tensile our knowing one another, loving one another is."